With the development of advanced adhesive and in particular adhesive tapes many manufacturing processes are moving away from mechanical fixings and adopting new methods of assembly. As a supplier of specialist adhesive tapes we were approached by a heating and cooling manufacturer to provide a tape that could be used in their manufacturing process. 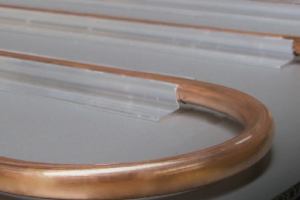 The adhesive tape was to be used in a heat transfer process, bonding an aluminium heating manifold to an alluminium plate where the heat would be radiated into the room. It would need the following properties, faster assembly time compared to traditional mechanical fixings, the ability to conduct temperatures up to 80°C without degrading the adhesive properties and it also had to be a specific non-standard width. A couple of tapes were selected based on the requirements and a testing process was under taken by the manufacturer. The final tape was then selected based on its performance capability (which exceeded the client’s requirements) and a price point that came in below budget, and it has also increased the speed of manufacture too. The use of the tape has been a huge success and production has increased to its current rate of 10km of tape a month and it is being considered for other elements of the manufacturing process. The tape has provided an enhanced appearance to the product allowing the visible surface of the heating element to be completely smooth, something that was not possible with rivets. Stress distribution and the thermal expansion and contraction is now even across the entire bonded surface rather than being focus at the point of the individual fixing points. The tape is actually faster to apply than mechanical fixing, a 3 stage process has now become a single stage process, reducing production time and therefore cost. The adhesive tape used in this case study can be found on our Trade Shop Direct website, it is a Double Sided Polyester Tape. If you have a specific adhesive tape requirement please give us a call and we will be happy to help, 01353 665141.